Buildcraft is a Minecraft mod that adds a wide variety of ways to bring the industrial revolution to your Minecraft world. With it's powerful machines and new ways to mine, it completely changes the way the game is played. 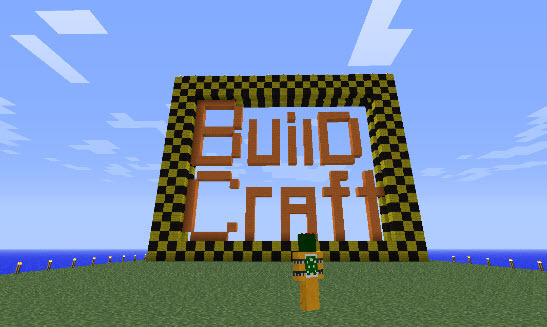 Buildcraft adds a number of new items to the game, from machines and automatic crafting tables, to mining quarries and pipes to move it all around. A good example of this would be a basic Buildcraft setup. A quarry would automatically mine up minerals and ores, and ship them via pipes to your base of choice. Here the ores would be smelted automatically using the Buildcraft machinery, and then crafted into any item of your choosing without you having to do a thing. And at the end it would all be sorted into separate chests for storage. In order to power all this new gear, you are going to need some engines. The engine system is where this mod really shines. Some engines can be run by redstone or coal but for the big guns you are going to need oil. Oil is a new resource that is unlike any other seen before in Minecraft. Being a liquid, it needs to pumped and stored in tanks instead of simply mined up. By building a oil refinery you can convert this resource into fuel which will help to power your new industrial empire.